We are delighted to advise that we are now accepting applications for the fifth cohort of Renfrewshire's successful DFN Project SEARCH programme. There are 12 places available for this cohort. DFN Project SEARCH is a college based, employability programme with a difference. The 12 students selected will initially attend a summer school one day per week in July to prepare for the year ahead. The programme is then delivered full time over an academic year (September 2019 - June 2020) with students working towards achieving a recognised qualification in employability. Students will also gain more than 600 hours of practical work based learning and training. They will do this through working in 3 different work placements within Renfrewshire Council. Support is provided on site by experienced job coaches and a college lecturer. This allows students to expand their skills and experience, with a view to applying for jobs on completion of the programme. 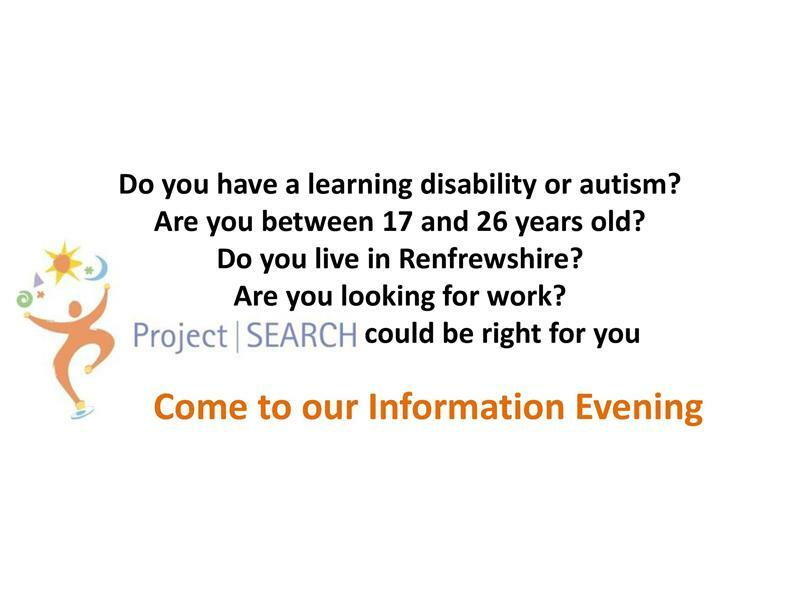 Renfrewshire Project SEARCH are hosting an information evening on 25 March 2019 from 6.00pm-7.00pm at Tweedie Hall Linwood (Next to Tesco). This event will provide more information about the course, student experiences, work placements and the application process. While we take every opportunity to ensure the details for DFN Project Search Information Session are accurate, we always advise that you contact the event organiser before setting out for the event to avoid disapointment.